For Syrian Refugees, Needs Are Growing And Aid Is Declining : Parallels The U.N. refugee agency has received less than half the $4.5 billion needed to help Syrians who have fled to neighboring countries. As conditions worsen, many are opting to risk the journey to Europe. Syrian refugees continue to arrive in Jordan, where they are greeted by authorities and sent to refugee camps and temporary settlements. The sheer number of Syrian refugees on the move is straining humanitarian aid agencies. The United Nations' main refugee agency, the office of the U.N. High Commissioner on Refugees, says it is financially broke, making it difficult to help millions of Syrians living in refugee camps in neighboring countries. Aid workers say the deteriorating situation in the camps is forcing more refugees to make the long and difficult trek to Europe. Every January over the past four years, the UNHCR has made an international appeal for donations to help Syrians fleeing the war. The money pays for food, shelter, medical treatment and the like in refugee camps in Lebanon, Jordan and Turkey. But Melissa Fleming, the agency's chief spokesman, says the response this year has been disappointing. "At the beginning of the year, we made an appeal for $4.5 billion to cover the needs of the 4 million refugees that are living in the neighboring countries," she says. "We are now in September, and unfortunately, we have only gotten a small portion of that funding, not even 40 percent." The UNHCR, like most of the U.N.'s humanitarian agencies, relies entirely on voluntary contributions from governments, corporations and individuals. If that money is not coming in, aid agencies have to adjust. 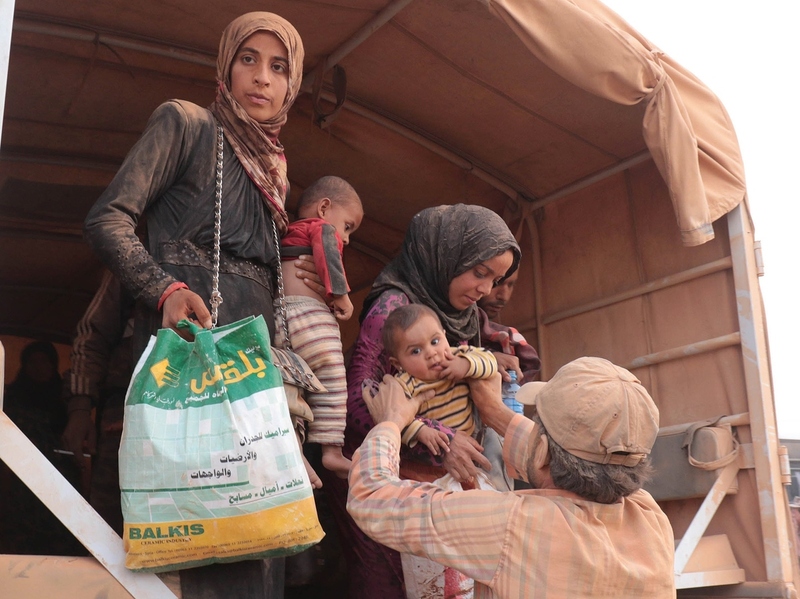 Abeer Etefa, with the U.N.'s World Food Program for the Middle East and North Africa region, says the WFP has had to cut off 360,000 Syrian refugees living in the camps from any sort of assistance — and slash food rations for more than 1.5 million refugees. "Right now, it's a maximum of $13 to $14 per person per month, that they receive in terms of food assistance from the World Food Program," she says. "That's less than 50 cents a day to eat and survive on." The Syrian refugees in the camps are having to find new ways to cope, Etefa says. "They either eat less or they're resorting to cheaper food, which does not give them the necessary nutrition," she says. "And some people are taking drastic measures, like taking their children off schools and sending them off to work or marrying off their daughters young." Fleming, with the UNHCR, says in the beginning, the refugee camps in Lebanon, Jordan and Turkey were a good option for Syrians fleeing the war. "It was close to home and they really, truly believed they could go back to Syria," she says. "They're losing that hope, unfortunately. And with the conditions worsening in the neighboring countries, many are deciding, 'Well, what do I have to lose, I'm going to risk my life, the life of my family, and get on a boat.' "
Nancy Lindborg, president of the U.S. Institute of Peace, says part of the reason raising money has been difficult this year is donor fatigue. "About 60 million people are currently displaced around the globe, 60 million," she says. "So the requirements are really exceeding the ability to raise that kind of money." Lindborg says individuals give very generously after a natural disaster — but not for complex conflicts, such as the Syrian war, unless something personalizes the issue, such as the picture of Aylan Kurdi, the 3-year-old Syrian boy who washed ashore in early September on a Turkish beach. "It refocused people's attention," Lindborg says, "because otherwise, you hear these mind-boggling numbers, you know. The 4 million refugees are ultimately not as meaningful as a picture of the individual boy, who represents in a very real way the suffering." The UNHCR says about $13 million was donated within a few days after the picture appeared. And the British government announced Monday it will give roughly $60 million for operations in the Syrian refugee camps.